I guess I opened up the door for all the other women. 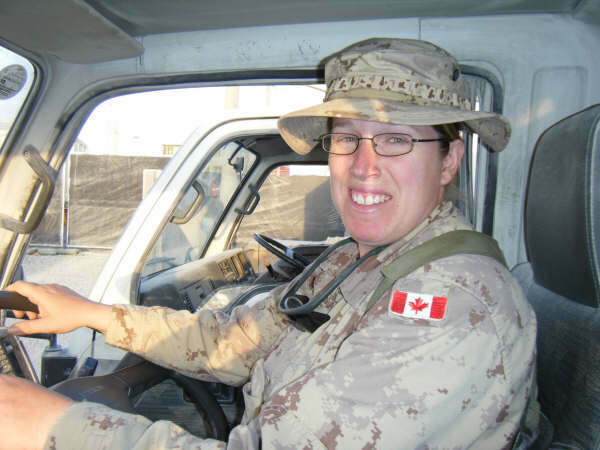 Master Corporal Kimberley Ashton has been in the Canadian Forces for fourteen years. Intrigued by an out of date policy stating: “due to the physical demands of this trade, women are not able to join.” Kimberley joined the engineers. 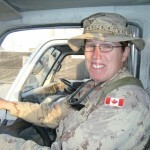 She was the first female engineer to come to CFB Petawawa in 1994, when there were no facilities for women in her unit. For years she felt isolated and under constant pressure to prove herself. In the mid 1990s she was posted to Bosnia and in 2008 she deployed to Afghanistan for a seven month tour. My oldest doesn’t want me to to go – yesterday I put her to bed and a few minutes later, she came out crying and told me I don’t want you to go mommy and that was really hard. I held her and she cried and I told her it was okay to cry and that I didn’t want to leave her but it is my my job. And I need to go help other people. I tucked her back in and I sat with her for a few minutes. She cried a bit more and then she was fine. My husband was worried that I would come home different – he didn’t want me to come home different and he didn’t want my children to not have a mother anymore. I believe the culture is changing, and it’s for the better. But there’s still a lot of things that need to be dealt with… since there’s more women now, there’s more families. Things need to change so that career and family can both work together because right now it’s not. Kimberley and her family live in Chalk River, Ontario.